The Airpura C600DLX features a large 3" super enhanced impregnated activated carbon bed (26 lbs of carbon!) to remove hundreds of common gaseous chemical contaminants and VOCs. The extra-deep carbon filter enhances contaminant contact time to increase chemical adsorption by the carbon media. A HEPA-grade post filter removes airborne particulate. 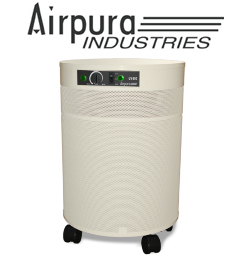 The Airpura C600DLX is equipped with a 560 cubic foot per minute variable-speed fan with a one-piece assembly to reduce vibration and noise, felt gaskets to prevent contaminant bypass (many competitors use rubber seals that off-gas VOCs), and an attractive powder-coated steel mesh housing with 360 degree intake. The Airpura 600 series has one of the highest air processing rates in the industry, however, noise level from the fan remains well below competitor's models with less air flow. Recommended Application: The Airpura C600DLX is recommended for applications with higher than typical concentrations of gaseous contaminants, chemical (VOC) reduction, and odor suppression. Airpura C600DLX is backed by an impressive manufacturer's 5 year parts replacement, and 10 year labor repair warranty.